In an attempt to make this event more sustainable, the DLIG and IIG Workshop Planning Committee would like to encourage attendees to bring their own reusable water bottles and eating utensils. We also would like to encourage you to carpool with a colleague when travelling to and from the workshop. Thank you very much for considering your environmental impact as you participate in this event! Please note that there are no refunds for registrants. 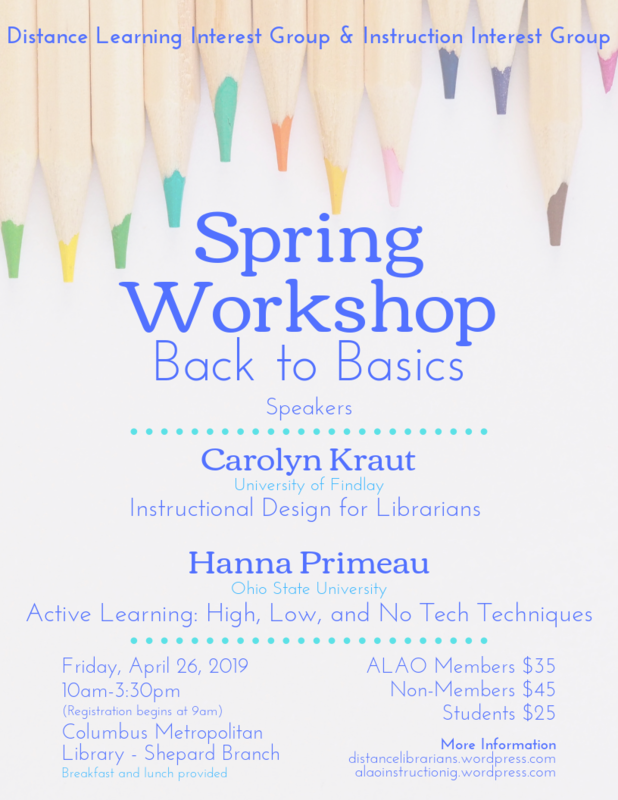 This year’s Distance Learning and Instruction Interest Groups’ spring workshop, titled "Back to Basics: Active Learning & Instructional Design," will focus on basic, evidence-supported strategies for designing library instruction. The workshop will feature two speakers that specialize in instructional design to lead attendees in hands-on, active learning sessions, as well as opportunities to connect and share with colleagues.